ZOTO Host Review 2019: Is ZOTO Host a Good Hosting? ZOTO Host presents itself as a provider of 100% SSD hosting solutions to businesses in the United States and around the world. It also offers reseller hosting, VPS, managed WordPress, and dedicated server solutions. Web hosting company ZOTO Host has its head office in San Francisco, California. Founded in 2015, this hosting firm was started with a mission to provide quality hosting solutions to business enterprises primarily in the U.S. but also in other countries. It offers 100% SSD shared hosting solutions as well as reseller hosting, virtual servers, managed WordPress, and dedicated server solutions. The SSD shared hosting solutions include unlimited disk space, unlimited bandwidth, 1 CPU core, and a private IP address. 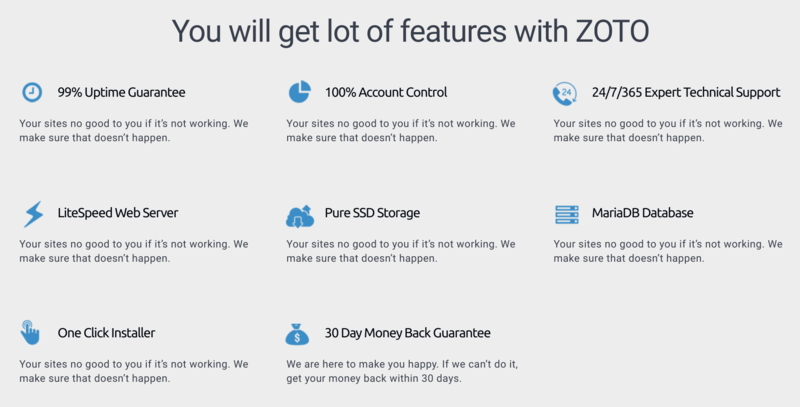 One of the outstanding hosting packages offered by ZOTO Host is the managed WordPress hosting that comes with a one-click WordPress installer, automated WordPress core updates, and unlimited SSD storage. 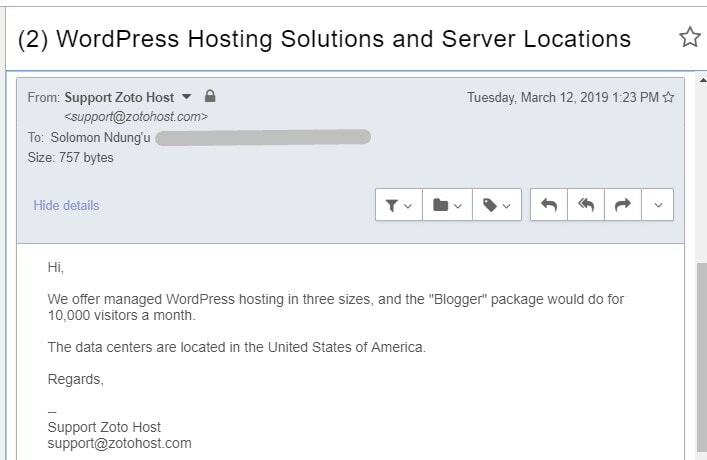 Customers can rest easy knowing that ZOTO will install, optimize, secure, and update WordPress, its themes, and plugins. While ZOTO Host performs daily, weekly, and monthly backups, it encourages customers to keep their own backups safe in case the vendor’s backups fail to restore. It does not offer backups at all for self-managed virtual servers. With SSD storage in RAID configurations to ensure maximum protection, ZOTO Host’s servers are optimized for speed and security. Loading speeds are also improved thanks to the use of the LiteSpeed Web Server. The physical servers sit in Tier 4 data centers located in New York and Miami. To assure high availability, these data centers are equipped with N+2 redundant power and environmental control subsystems. However, the 99% uptime guarantee is actually pretty low for a hosting provider. ZOTO Host’s hosting plans are somewhat expensive, maybe because of the 100% SSD-based server storage. These plans come with few feature restrictions. Plans are priced in U.S. dollars and can be bought on monthly or yearly billing terms, with no apparent discount for an annual commitment. Nonetheless, you get a 30-day money-back guarantee that should give you some comfort if you decide to dive in for a full year. You can contact ZOTO Host’s 24/7 technical support team by telephone, ticket system, email, or live chat. The team responds quickly to queries, and I received a reply to my test email within an hour. This is fortunate because this company’s knowledge base link leads to a “not found” page. ZOTO Host’s SSD-powered hosting plans are designed to suit all kinds of businesses. With just five years in the hosting industry, this vendor seems to have picked up the pace, and it could be well on the way to claiming a significant share of the American market. Its feature-packed hosting packages can even host the most complex high-traffic websites. Wondering how ZOTO Host stacks up against other Web Hosting companies? Enter any other Web Hosting company and we will give you a side-by-side comparison.